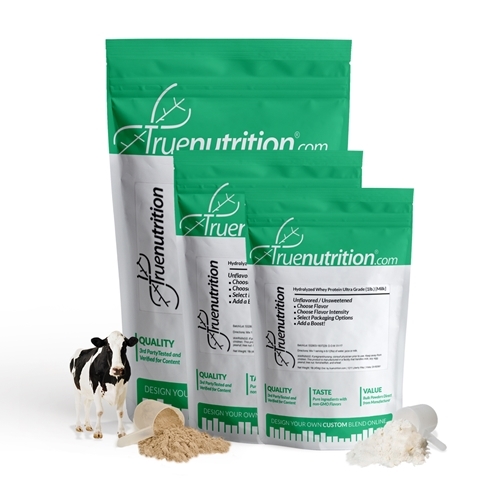 True Nutrition's Hydrolyzed Whey Protein Ultra Grade is a high quality protein produced through a controlled enzymatic-treatment of whey protein, which has undergone 13% total hydrolysis to help support increased digestibility of the protein materials. Hydrolyzed Whey Protein Ultra Grade is sourced from cows that are not administered hormones or antibiotics, and the resulting material is entirely soy-free! The concentration of pre-digested protein does result in a dramatic increase in bitterness associated with this material. Hydrolyzed Whey Protein Ultra Grade provides 24g of protein per serving to help support muscle building in post-workout nutrition! Mix-ability: Stir or shake rigorously, as clumping will occur. Taste: Strong bitterness that mixes better with most flavor types. Great protein, awesome price, clean digestion, no bloat, good muscle builder, and solid recovery protein. The only con is the bitter taste that comes through sometimes, depending on flavor boost. I would advise doubling up your flavor boost with less rich/intense flavors. I use this as 40% of my post workout blend and it overpowered the salted caramel flavor and came through a little bit on the fudge brownie flavor. I left the fudge brownie flavor at standard level but I'll be doubling up the salted caramel flavor next time to cover the bitter taste. As a note, salted caramel protein mixed with a cup of coffee (add water for desired consistency) is awesome!